Robert F. Stuart has served as the Executive Director of the Christian Service Center since 1995. The Center is the result of a collaborative outreach of the downtown Orlando churches and first opened its doors on June 1, 1971. Since their inception, the Christian Service Center has provided the most vulnerable populations of Central Florida with various programs designed to meet physical, emotional and spiritual needs, regardless of race, religion or gender. Millions of men, women and children have been served from the Center’s three locations in Downtown Orlando, West Orange County and Winter Park. Robert was first elected to the Orlando City Council, representing the citizens of District 3 in 2006. He was subsequently re-elected in 2010, 2014 and 2018. From Baldwin Park to Signal Hill, District 3 is made up of some of Orlando’s oldest and finest neighborhoods and covers most of the area north of State Road 50. Commissioner Stuart has built coalitions of concerned citizens from all over the Orlando community to address the issues surrounding homelessness, poverty, affordable housing, education, transportation, senior adults, and more. 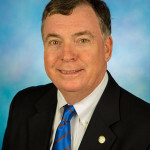 He is also a past board member of Heart of Florida United Way’s (HFUW) Community Services Network/211, the Orange County Historical Society, College Park Rotary Club, and the PTA/PTSA of Lake Silver Elementary, Lee Middle, and Edgewater High Schools. Along with Mayor Dyer, he also serves on Orlando’s Finance Committee, overseeing our City’s investment policy. He was instrumental in the creation of the Edgewater Drive Vision Task Force, the renovation of Historic Dubsdread Golf Course, and countless public safety initiatives. Commissioner Stuart was born and raised in Orlando and has served the local community in many ways. Prior to serving on the City Council, he served the City as the co-chair of the Mayor’s Working Committee on Homelessness, originally appointed by Mayor Glenda Hood, and was asked to continue by Mayor Buddy Dyer. He also served on the initial task force for Orange County’s Council on Aging. Commissioner Stuart continues to serve his community through his involvement with the College Park Neighborhood Association and HFUW Council of Agency Executives. Commissioner Stuart is a graduate of the University of Florida and has been married to his college sweetheart, Ann, for 41 years. They have two grown children, Maribeth and Robert, Jr. and five grandchildren. He is active at Church on the Drive, formerly College Park Baptist Church. He also continues to umpire baseball throughout Central Florida, and has umpired in two Little League World Series Tournaments (1996, 2005).